Electrical transformer is a static electrical machine which transforms electrical power from one circuit to another circuit, without changing the frequency. 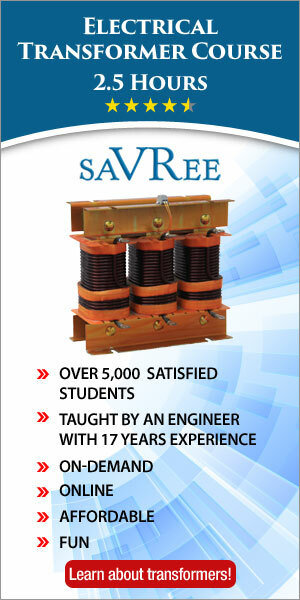 Transformer can increase or decrease the voltage with corresponding decrease or increase in current. The basic principle behind working of a transformer is the phenomenon of mutual induction between two windings linked by common magnetic flux. The figure at right shows the simplest form of a transformer. Basically a transformer consists of two inductive coils; primary winding and secondary winding. The coils are electrically separated but magnetically linked to each other. When, primary winding is connected to a source of alternating voltage, alternating magnetic flux is produced around the winding. The core provides magnetic path for the flux, to get linked with the secondary winding. 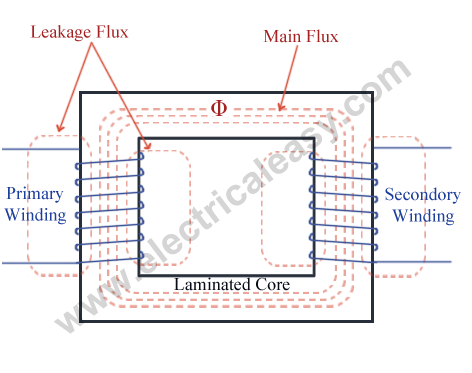 Most of the flux gets linked with the secondary winding which is called as 'useful flux' or main 'flux', and the flux which does not get linked with secondary winding is called as 'leakage flux'. As the flux produced is alternating (the direction of it is continuously changing), EMF gets induced in the secondary winding according to Faraday's law of electromagnetic induction. This emf is called 'mutually induced emf', and the frequency of mutually induced emf is same as that of supplied emf. If the secondary winding is closed circuit, then mutually induced current flows through it, and hence the electrical energy is transferred from one circuit (primary) to another circuit (secondary). Basically a transformer consists of two inductive windings and a laminated steel core. The coils are insulated from each other as well as from the steel core. 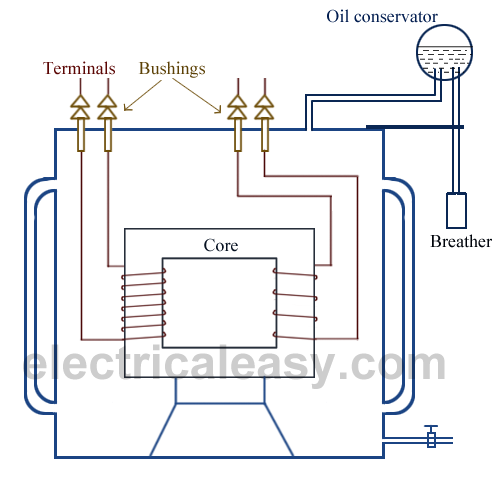 A transformer may also consist of a container for winding and core assembly (called as tank), suitable bushings to take our the terminals, oil conservator to provide oil in the transformer tank for cooling purposes etc. The figure at left illustrates the basic construction of a transformer. In all types of transformers, core is constructed by assembling (stacking) laminated sheets of steel, with minimum air-gap between them (to achieve continuous magnetic path). The steel used is having high silicon content and sometimes heat treated, to provide high permeability and low hysteresis loss. Laminated sheets of steel are used to reduce eddy current loss. The sheets are cut in the shape as E,I and L. To avoid high reluctance at joints, laminations are stacked by alternating the sides of joint. That is, if joints of first sheet assembly are at front face, the joints of following assemble are kept at back face. Transformers can be classified on different basis, like types of construction, types of cooling etc. 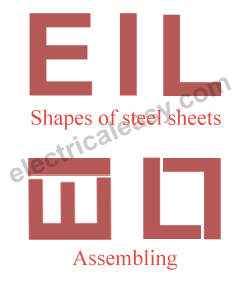 (A) On the basis of construction, transformers can be classified into two types as; (i) Core type transformer and (ii) Shell type transformer, which are described below. In core type transformer, windings are cylindrical former wound, mounted on the core limbs as shown in the figure above. The cylindrical coils have different layers and each layer is insulated from each other. Materials like paper, cloth or mica can be used for insulation. Low voltage windings are placed nearer to the core, as they are easier to insulate. The coils are former wound and mounted in layers stacked with insulation between them. A shell type transformer may have simple rectangular form (as shown in above fig), or it may have a distributed form. Step up transformer: Voltage increases (with subsequent decrease in current) at secondary. Step down transformer: Voltage decreases (with subsequent increase in current) at secondary. Distribution transformer: Used in distribution network, comparatively lower rating than that of power transformers.